Dell has just updated its 13-inch XPS notebook for 2018 with a number of changes, including a thinner and lighter design, more ports, and the latest Intel processors that up the ante from a dual-core to a quad-core design, while sticking with the same 15-watt power rating. 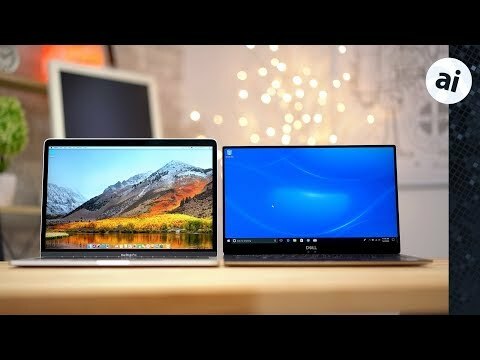 As one of Apple's the biggest competitors in the notebook space, AppleInsider decided to pit the XPS against the latest 13-inch MacBook Pro to see how the two stack up. Starting with the exterior, the XPS is both smaller and lighter than the MacBook Pro, weighing in at 2.65lbs compared to 3 pounds. At just under 12 inches, the width is roughly the same across both notebooks, but the MacBook is a bit deeper at 8.36 inches compared to the 7.8 inches for the XPS. Our MacBook Pro is also thicker at 0.59 inches while the XPS is 0.46 inches at its thickest point, if you omit the feet like Dell does for its measurement. The biggest reason Dell can fit a 13" display in such a small shell is its "infinity edge" design, which makes the gorilla glass 4 screen feel like it's floating. Even though the design is impressive, it does have some limitations that we'll cover when we compare the displays. The Macbook's design is simple and beautiful, and the all-aluminum build with its metal hinge feels solid. Most would agree that Dell's XPS 13 design isn't quite as nice, but it still looks and feels great with a mix of aluminum and soft touch coated carbon fiber, though the new gold and white color scheme does look gorgeous. The only real design suggestion would be a cutout for opening the display, and a slightly softer hinge resistance for non-touchscreen models. Battery capacity is close, with the Mac including a 54.5 watt-hour battery compared to the 52 watt-hour version in the Dell. Our 2017 13-inch MacBook Pro includes a charger with a higher wattage, providing 61 watts against the XPS charger's 45 watts. Both chargers use USB-C connectors, but the XPS has a separate cable that lowers the brick away from the wall socket, rather than using Apple's all-in-the-plug design. The XPS charging cable includes an LED indicator and a cable management clip, but unfortunately it is hardwired into the power brick. Both machines won't need their charging cable plugged in too often as they offer class-leading battery life. Our MacBook Pro is rated for up to 10 hours of web use, which we often exceed, and Dell lists the 1080P XPS 13 9370's as capable of lasting for up to 13 hours of streaming or web browsing, which lines up with our experience. With the 2016 redesign of the Macbook Pro, Apple did away with most peripheral ports, leaving two Thunderbolt 3 ports for the base machines like ours, or four if you purchase a Touch Bar-equipped model. Thankfully Apple left the headphone jack in place. The 2018 update of the XPS made the machine lighter and thinner, forcing Dell to remove the standard USB ports, SD card slot, and charging plug. We now have three USB-C ports, two of which support thunderbolt 3, and a microSD card slot. The USB-C 3.1 port on the right-hand side supports display connections, and the Thunderbolt ports run at full speed bysupporting four PCI lanes, just like the Macbook Pro. This means you can now connect external graphics card enclosures to the XPS. Dell does include a USB-A adapter in the box with the XPS, which is a nice extra Apple does not afford. Even though the XPS shows a charging logo next to the top-left USB-C connector, you can actually charge the notebook through any of the ports. There is also a convenient 4 LED battery indicator and a status light on the front of machine. Both notebooks are equipped with 8GB of low-power DDR3 memory, but the Macbook is clocked slightly faster at 2133GHz instead of 1866GHz. Storage consists of a 256GB solid state drive with write speeds of over 1,200 MB/s write speeds. The XPS comes in with much faster read speeds at 3,313MB/s versus 2,358MB/s for the MacBook Pro, but with speeds this high you don't really notice a difference in real world use. One of the most important upgrades in the 2018 XPS 9370 is the 8th generation Intel CPU, which for the first time features four cores and eight threads in a power-sipping 15-watt design. Our XPS uses a Core i7 1.8GHz processor that turbo boosts up to a surprisingly high 4.0GHz. The MacBook Pro uses a 7th generation dual-core i5 clocked at 2.3GHz with a turbo boost up to 3.6GHz. Starting the benchmarks with GeekBench 4's CPU test, the single core speeds were surprisingly similar, with the Mac scoring 4,511 and the Dell at 4,591. Taking a look at multi-core results, the quad-core in the XPS really shines with a score of 13,658 compared to 9,418, which was already impressive in the 2017 MacBook Pro. Moving to the 3D rendering benchmark of Cinebench R15, the MacBook finishes with a decent score of 379, but the XPS 13 swoops in with a score of 598. This is huge step up in CPU performance-per-watt compared to previous quad-core designs, coming in slightly faster than a 2015 15-inch MacBook Pro and getting close to the current base model 15" MacBook Pro, while using less than half the wattage. Both of these machines ship with integrated Intel graphics. Our 13-inch MacBook Pro comes with the higher-end Iris Plus 640 Graphics, which gave us a Geekbench OpenCL score of 29,435 compared to 22,634 for the Intel UHD Graphics 620 used in the XPS 13. If you plan on doing some light gaming or other tasks that can directly use all of the graphics performance, the Mac will fare better, but processor-reliant tasks like video editing and rendering will still be faster on the Dell. Cinebench R15 gave us a graphics rendering score of 47.83 frames per second compared to 37.84 FPS on the Mac thanks to the much-faster processor. Arguably the biggest difference between the two are the operating systems they use. While a detailed comparison is saved for later, I have to say my preference is for Mac OS. I grew up using Windows and only switched to using a Mac full-time about four years ago. Setting up the Dell XPS took much longer than the Mac, and it was more cumbersome. In the time I've spent with it, I've already endured a few software glitches, a driver crash, and a frustrating experience with popups from bloatware pre-installed on the machine. While Mac OS isn't perfect, I find it easier to use with less issues overall. Even though I'm a power user I appreciate the MacBook doing most things efficiently so I can focus on my work. With that said, I find Windows 10 to be Microsoft's best operating system yet, and if you're looking into purchasing one of these two systems, that means you're open to using either OS. Putting it right out there, the Macbook's display is better in every way. Sure, the Dell's almost bezel-less design is striking, but it also forces the webcam down next to the hinge. This makes for a very unflattering perspective that could be a dealbreaker for those that often use the camera. The Mac's FaceTime camera not only looks better in terms of its viewing angle, but also for video and sound quality. Both of these machines are listed as 13-inch notebooks, but the Macbook's screen uses a 16:10 configuration resulting in extra vertical space. Displays are measured diagonally -- making the screen sizes seem similar on paper. In reality the MacBook Pro has more surface area. The Dell XPS 13 is closer to the 12-inch Retina Macbook in usability, sharing the same height, but with the Dell a bit wider. The Dell XPS 13-inch is closer to the 12-inch Retina MacBook in usability, sharing the same height but coming in a bit wider. The Macbook also comes out on top in regards to color accuracy, viewing angles, maximum and minimum brightness, and resolution. Our XPS 13 features a 1,920x1,080 display compared to the 13-inch MacBook Pro's 2,560x1,600. This results in about twice as many pixels which is definitely noticeable. For brightness, the Mac is rated at 500 nits, which is about the minimum needed to use outdoors in the Sun, whereas the Dell XPS 13 screen offers a more standard 350 nits. There is a 4K-resolution touchscreen option for the XPS which has even better color accuracy than the MacBook, but it is just as dim. We think the 1080p option will be better for most people, since 4K is really overkill on a 13-inch display and Windows 10's mediocre resolution scaling can cause issues at times. It is also more expensive, and the notebook's battery life takes a noticeable hit from the increased pixel count as well. Along with the built-in fingerprint reader, which our non-Touch Bar MacBook lacks, one of our favorite feature is the Windows Hello sign in. It uses similar technology to Face ID and works incredibly quickly. As someone who loves Face ID on my iPhone X, this is exactly what I want on my MacBook, iMac, and iPad. As soon as I fully open the XPS 13, I'm already logged in, just like when I swipe up on my iPhone. I don't know how secure Microsoft's implementation is compared to Apple's, but chewing a granola bar was enough for Windows Hello to not accept my face. Apple does offer Touch ID login if you buy a more expensive MacBook. You can also automatically log in with an Apple Watch, but I stopped using it since it often took longer to authenticate than entering my password. Below the 2018 Dell XPS's display is a surprisingly good keyboard that most will prefer, compared to Apples minimal travel butterfly keys. I prefer the really clicky keys on the latest MacBook models unless I have a full day of writing to do, which results in tired fingers. The XPS keys are fairly quiet with a quality feel, resulting in one of the best keyboard I've ever used on a Windows-based machine. Moving even lower, the trackpad is a big step behind Apple's design. Just like the display, it's not terrible, and is likely one of the best options in a Windows notebook. However, once you get used to Apple's Force Touch trackpad that's about twice as large and has a perfectly even feel no matter where you press, and that can also be adjusted to user preference, nothing else compares. Apple has been leading in audio playback since the launch of the 12-inch Retina MacBook, where it managed to stuff shocking volume and sound quality into a tiny chassis. Our 2017 13-inch MacBook Pro's speakers face the user and are louder with more boom on the low end, clean mids, and crisper highs. On the Dell, the volume is good enough for most situations, but the sound quality is subpar and the speakers fire to the sides. If you're coming from a cheaper Windows notebook, you'll likely be fine with the speakers, but anyone moving from a MacBook will be disappointed. If Dell were to improve the trackpad, speakers, and display brightness, the XPS 13 would be a near perfect product. I'd love to see Face ID in a MacBook along with the same 8th generation Intel processors. I'd also take thinner bezels, as long as it doesn't result in the webcam moving below the display. Dell has done a great job creating and updating the 13-inch XPS. Not only is it thinner, lighter, and smaller than Apple's latest 13-inch MacBook Pro, it does so with great build quality, impressive performance, and better battery life. While even the incredible Windows Hello isn't enough to dig me out of the Apple ecosystem I'm invested within, if you're flexible and are considering a Windows machine, the Dell XPS 13 9370 would be at the top of my list. It is common for Windows notebooks to deliver more performance and features per dollar compared to a MacBook equivalent, but what isn't as common is for the product to be so well rounded while exceeding the Mac in so many areas, and the 2018 Dell XPS 13 9370 manages to do just that. Apple authorized reseller and AppleInsider partner Adorama is currently offering readers exclusive savings on the Mid 2017 13-inch MacBook Pro with a 256GB SSD. Save an additional $30 on top of a $70 instant discount with coupon code APINSIDER, bringing the cost down to $1,399.00 with no tax collected on orders shipped outside NY and NJ. Those interested in financing the purchase can also take advantage of no interest when paid in full within 12 months using the Adorama Credit Card. Need help? Send us a note at [email protected] and we will do our best to assist. B&H, also an AppleInsider partner, is discounting the Dell XPS 13 9370 to $1,324.00 with free expedited shipping to the contiguous U.S.
WTF "that grip is too tight to get out of..."
The Dell looks cheap sacrificing usability for the dumb small bezel design with bad speakers, much lower resolution dimmer display and Windows. There is no grip too tight or ecosystem nonsense. Its just not a better overall notebook even when both running windows. Double the internal SSD (if you can of course, I guess it's BTO these days) install Boot Camp and have the nearly best of both worlds in Apple quality hardware. 1) Great review and excellent comparisons of the pros and cons. 2) As stated, that thin bezel looks great, but the camera placement, all the display and backlit quality shortcomings, and that hinge are just bad. 3) This Dell is thinner than the MBP, but according to certain posters here Apple only cares about thinness. Maybe they need to rethink that and realize Apple tries to make the best machine they can for a given price range, performance, and utility, which is why components, like the speakers, are usable. I've been using a Dell XPS for the past two years alongside a MacBook Pro (2016 and most recently 2017 - but I have owned and used Macs going back to the iBook G4), and to me, the XPS has been a far nicer experience than the MBP. Firstly, no [censored] keyboard problems unlike the MacBook Pro which suffered from a stuck Command key on a couple of occasions. Secondly, the display on the XPS has been fantastic. It has a super sharp image and gets the job done. The form factor of the XPS is also very good for keeping space in a bag to a minimum. Windows 10 has been a pain in the arse, of course it has, but I can also think of issues with MacOS too. But, despite in its infancy, I *love* the Windows Linux Subsystem. In short - you try both and pick what you like. I happen to have favoured the XPS for now. When it comes to recommending window systems, always recommend Dell. They’re solid and provide decent support. That XPS laptop looks like they’re finally taking Apple seriously. That being said, Dell couldn’t pay me enough to give up my MBP. Windows alone ruins it for me. But but but the ATP crowd swears the MBP keyboard issues are a result of Jony Ive having too much control and Apple being obsessed with thinness. Yet this Dell XPS is thinner than the MBP. Clearly the issues with the Mac keyboard aren’t because of the devices thinness. I’m a 2017 MBP owner that hates the keyboard ... Ive tried to like it but every time I borrow my kids MBA I’m like “whoa”. Nice observation. I was making a similar point (specifically that we don't know if the issues are because the bottom casing is thinner) in the the thread last week about the MBP's keyboard issues. Probably shouldn’t get your hopes up. Apple are letting retailers have big sales because there are trying to clear inventories for the laptop updates coming this summer. A lot of the PC vendors have models with Coffee Lake Intel processors available now, or for order, or have announced them. Apple isn’t far behind. Looking like WWDC is a time for Apple to update that MBP and iMac lineup to Coffee Lake chips. Whether they have a different keyboard design is a whole lot more uncertain. I wouldn’t bet on it. It’s just going to be the 4th gen MBP with Coffee Lake processors. The iMac 4K may get Kaby Lake G (with mobile Vega GPUs in the MCM). The iMac 5K will get 6-core models. The MBP13 will get 4-core models, assuming the right GPU SKU is there. The MBP15 will get 6-core models, at least on the high end. And, who knows about the low end. Not sure what the issue with unlocking with  Watch would be. I unlock my iMac at work every day with  Watch. Super quick. Weird it’s such a hassle for you. Me, too. it's very fast and convenient, for me. And this was with the Series 0 and Series 3 Watch on both a 2013 and 2017 15" MBP. Exactly what I was thinking. I use Win10 at work, both at my desktop and setting up systems for other uses. I don’t want to use it at home. However if I needed a laptop for some mobile function and a MacBook, or my iPad Pro wasnt an option, Linux on this might be a real option. OTOH its a Dell. I dobt like, or trust, Dell systems. Been burned, and seen to many others get burned by shoddy construction, terrible support, and haphazard quality control. Did you actually measure the thickness of the Dell? The MBP isn’t 0.59/0.46 = 1.28x thicker than the XPS13 here. If anything, they look about the same thickness, with perhaps the Dell being thicker depending on the curvature. Since you say if don’t include the feet, the Dell XPS is thinner. This means that when laying on the table, the XPS13 is higher than the MBP? 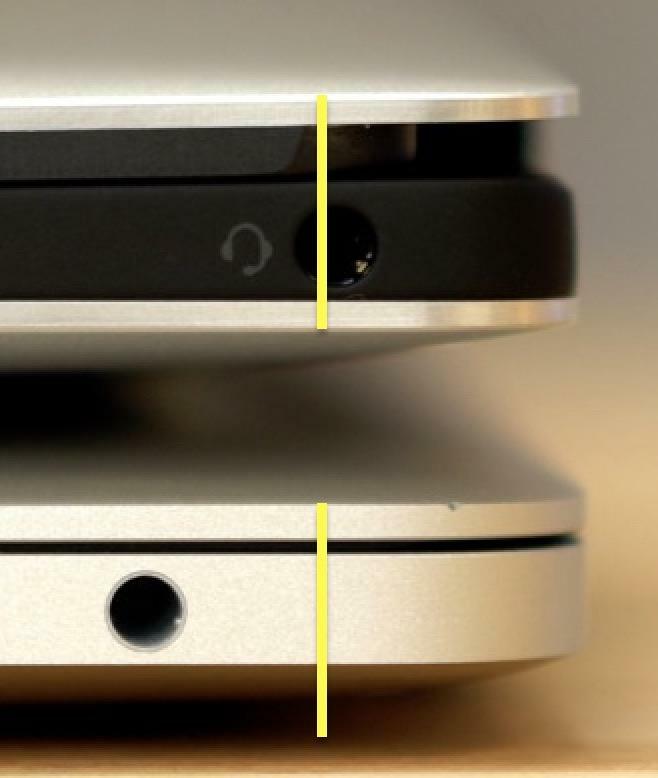 If so, how do you know the feet of the XPS13 are thicker or taller than the feet of the MBP? After some basic photogrammetry, the 0.45” dimension looks to be the thickness on the very back face of the XPS13, and it’s not the actual thickness of the device. You can clearly see the XPS 13 is bulging thicker as you move away from the back Face. 1) I noticed that, too, but assumed it was just how the image was shot. 3) I wonder if that extra thick lid for the Dell is why their keyboard can have more travel. Prior to the TB3/USB-C MBPs the top lid on the MBP had a more defined metal edge that protruded further away from the display glass. Dell should just shut down and return the money to its stock holders. I bet they make almost no profit from that laptop. Less than Apple, at any rate.